trip planning – old school! 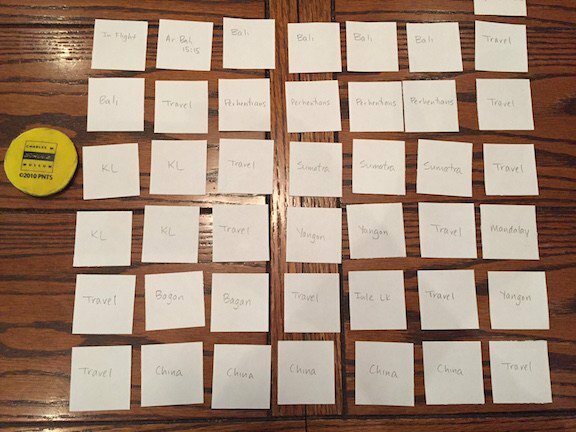 Remember the index cards we laid out on the table last July to plan our Asia tour route? Well all that work is coming to fruition beginning Saturday! And it’s not at all in the order these cards are laid out, although the majority of the places we began our Asia itinerary with are still there! We’ll begin our trip with a visit to Beijing and Xi’an, China with a guide from China Highlights. We found them through a group called Responsible Travel that we used when we went to Africa. They partner with tour companies that use local guides and focus on community building. We are hoping we’ll get better insights into what we’re seeing and be able to maximize our time in China by using a local guide. It’s more expensive to travel this way, but for this portion of our trip, we felt it would be worth it. Next stop is a short visit to Kuala Lumpur where we’ll meet up with friends Stacie and Steve who currently live and teach in Myanmar — visting them was the impetus for this whole trip! From KL, the four of us are heading over to the jungles of Sumatra (another Indonesian island) where we’re hoping to see orangutans in one of their few remaining natural habitats. We’re also taking a half-day village tour and a cooking class! And perhaps Jeff and Steve will be sampling Indonesian beer (one beer costs the same as the rest of the meal!) on the balcony of our treetop bungalow. 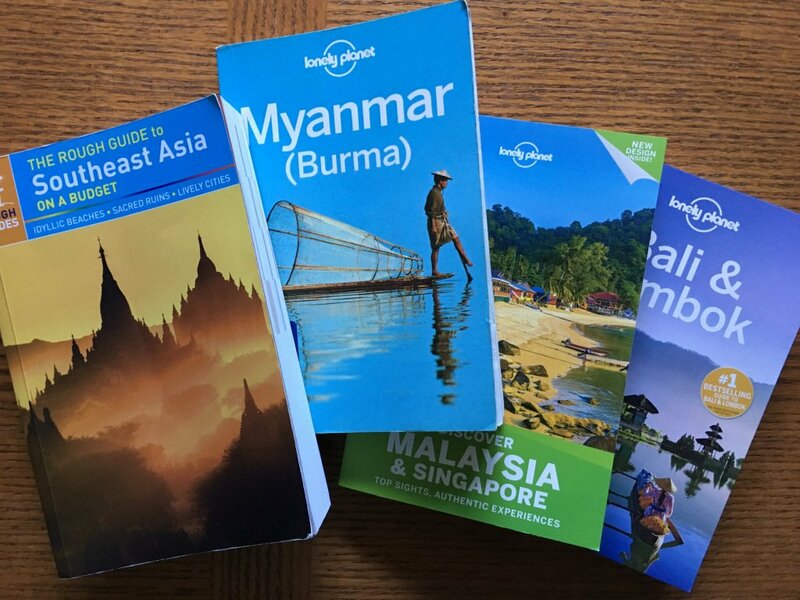 Our travel guide books – we’re getting ready to rip out only the pages we need to take with us! We’ll go back to Kuala Lumpur from Sumatra for a few days to explore the Batu Caves and do another birdnerd day. 12 full hours of birding! We’ll see how nerdy we really are before heading to Myanmar. We’ll do lots of exploring in Yangon seeing the golden temples, giant Buddha statues, and chubby cheeked babies. We’ll head out for another birding adventure (two days this time!). We’ll visit some of the 2200 temples left in Bagan, and finish with another cooking class and a boat trip on Inle Lake. The end of our trip will be spent in the Perhentian Islands — a beautiful area off the coast of Malaysia known for its laid-back beaches, snorkeling, and not much else. Seems like a perfect place to wrap up our vacation! We head home from there. We found a housesitter for our cat through a service called HouseCarers.com. It’s a great service that matches people who want to housesit with people who need housesitters. If you’re looking for a housesitter, check them out. It’s free for people looking for a sitter. If you’re looking to travel inexpensively, this might be an option for you. Nearly free lodging (housesitters have to pay a fee to the agency, but it’s not huge) in exchange for taking care of someone’s house and possibly pets and plants. We made a Google Tour Builder page for our trip, so if you want to follow along each day, you can! You’ll read about what we will be doing each day and scroll through a few pictures of each destination. You can even plop yourself right down into some of our destinations by dragging the little yellow person icon onto a blue dot or line. Once you are in street view, walk around a little! This program is in beta, however, so it can be a little (or a lot…) glitchy. Follow our social media channels to see photos we post during our trip: @aweekoraweekend on Twitter, A Week or a Weekend on Facebook, or @kidding_around_photography on Instagram. Just look for the hashtag #AWOWinAsia! 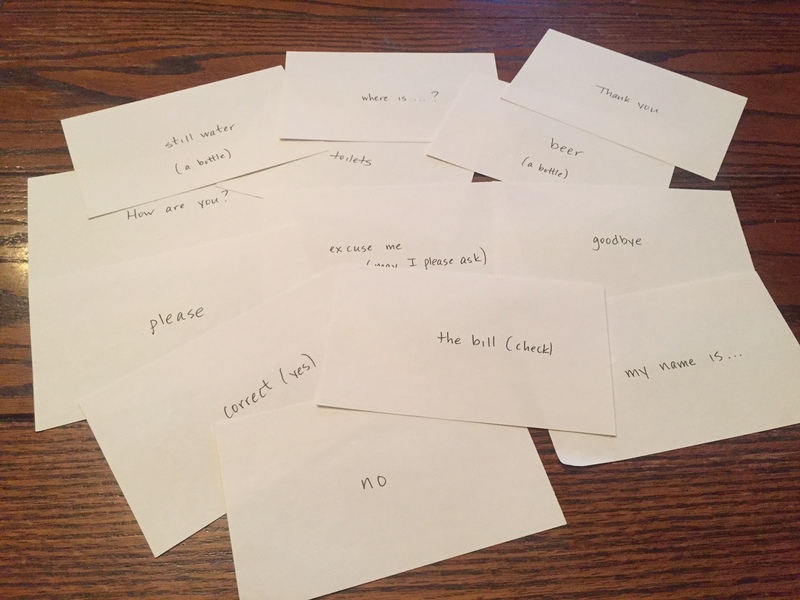 Now, we need to get back to our newest pile of index cards, language flash cards! (It’s like being in high school again!) Enjoy your summer adventures, whether they’re for a week or a weekend! Some of our Chinese language flashcards. We’re up to nearly 20 words and phrases!